Today is the first day of Inspired by Stamping November release. This month's release includes 5 stamp sets and Vintage digital paper. 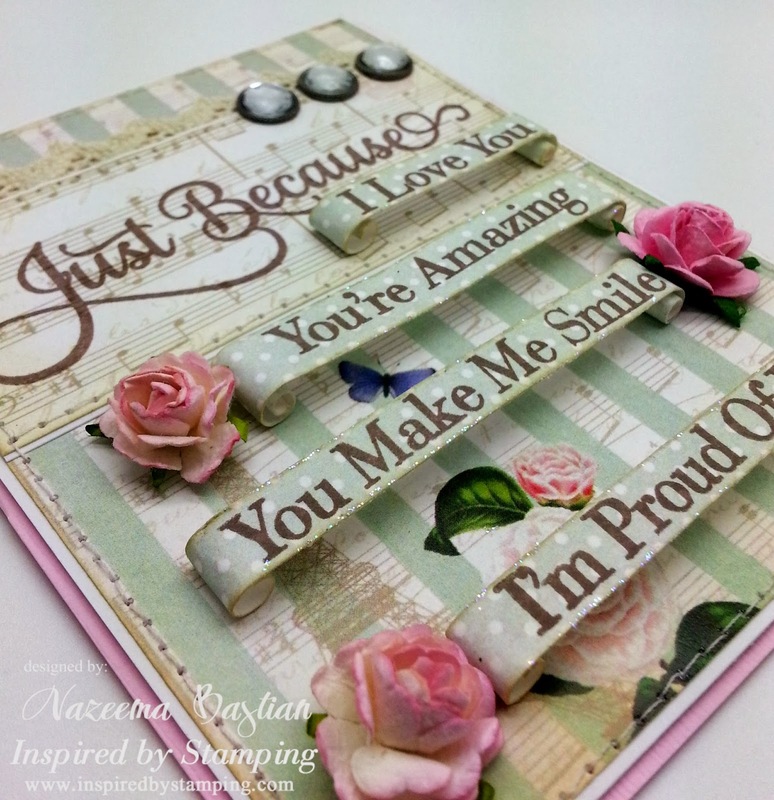 Today's I am showcasing the Just Because stamp set. Our number one seller is our Happy Sentiments stamp set and we thought it would be fun to create a “Just Because” sentiment set. 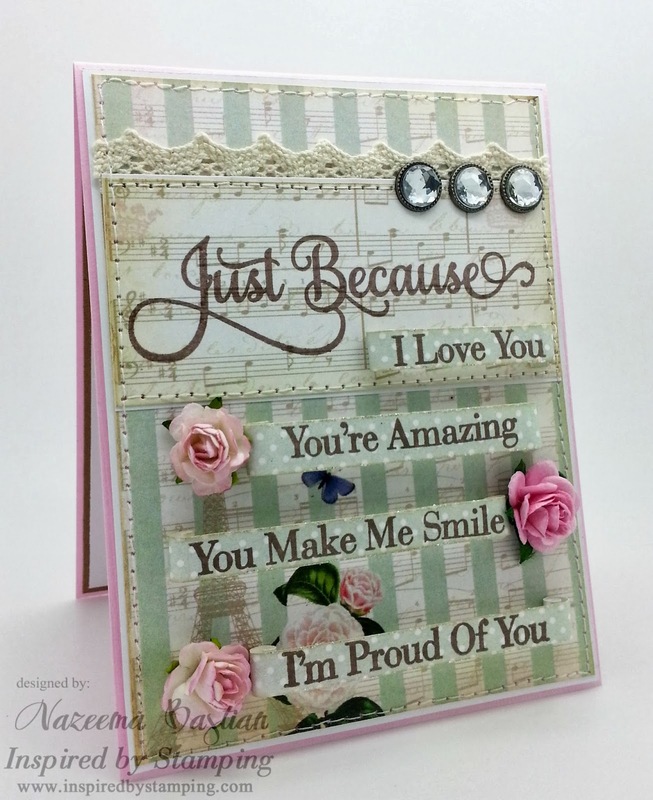 This set will coordinate perfectly with Happy Sentiments stamp set. It contains 12 unique sentiments and is a 4×6 size set. Oh isn't this just lovely?!?! For my card, I used 4 of the smaller sentiments that will be found in this set. I love how they can be used together or simply by themselves. I had to show you a different angle of the card, so you can see how I attached the sentiments. I distressed the strips, curled the end in and added glitter glue to the edges. So there you have it!! I hope you loved my project today. Here is today's line up and you will not want to miss a stop. The projects are incredibly gorgeous!! For our Australian customers, Free Shipping for orders over $25. All International Customers, Free Shipping over $50. No code needed. Sale will be for 48 hours ONLY and will end Tuesday, November 12th, 11:59PM AEST (Brisbane Time) No exceptions. available for purchase at 7pm Brisbane time. You have until 6pm AEST (Brisbane Time), November 7th, to leave your comment and be eligible to win. Only one comment per person please. One randomly selected winner will be announced Joanna's blog tomorrow and on IBS Winners Page before 7pm AEST. So so pretty, Calypso! The way you attached the sentiment strips is clever. Awesome card Calypso! Love the pretty details! The way you attached the sentiment strips is fab! Gorgeous card ! I loved the curled sentiment strip n glittered edges ! Fabulous way of adhering the sentiment strips, love it! OMG, those sentiments strips are awesome!! Fabulous card with so many beautiful designer details! I just love the way you used a collection of sentiments!!! Fabulous raised banners with fabulous details!!! Just Gorgeous! Love the wonderful dimensional scrolls you've created and the sweet lace and stitching! So fun and full of detail and dimension! A gorgeous and elegant card.